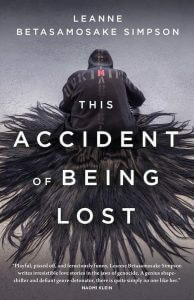 This Accident of Being Lost is a powerful collection of short stories and songs by Leanne Betasamosake Simpson, a Michi Saagiig Nishnaabeg scholar, writer and artist, who is quickly becoming known as one of the country’s greatest storytellers. Unique in its fragmented and casual, yet lyrical and elegant language, This Accident of Being Lost introduces readers to memorable and resilient characters, most grappling with uncertainty. From boreal forests to the Great Lakes, and from urban centres to rural communities, This Accident of Being Lost forces readers to look at Canada differently. Jessica Rose is This's reviews editor.